Få et opfattet kig på den antikke aristokratiske by Herculaneum og den mægtige vulkan, der begravet det på denne heldagstur fra Sorrento. Rejser med luftkonditionerede trænere til UNESCOs arkæologiske område, hvor du kan beundre bemærkelsesværdigt velbevarede villaer, badeværelser og fresker, der er frosset i tid med vulkansk affald. Derefter opstigning Mt Vesuvius selv for panoramaudsigt over ruinerne og kysten, og tag en valgfri tur til toppen til peer i mundingen af ​​det destruktive krater. The trip itself was good. We had a somewhat difficult time understanding the tour guide on the bus and in Herculaneum. A very strong accent combined with a poor sound system made it challenging. He did have good knowledge of the Herculaneum site. It was also nice that the lunch restaurant allowed picnic lunch area. It would have been nice to have more time at Mount Vesuvius. It was pretty rushed to hike up, spend time with the local guide, walk around the site and get back down. The biggest problem was that we almost missed the tour completely because the meeting time and location were wrong on the actual Viator voucher. We strongly recommend confirming with the local tour provider. The local company (Acampora Travel) saved the day with exceptional customer service that helped us join the group in progress. Had a wonderful day with our guide Emanuela. She was informative yet fun. The hike to the top of Mt Vesuvius is quick but was able to get great pics once up there. Need to move quickly down to catch the bus. There only a couple of porta potties at the bottom that are a Euro each so plan accordingly. Herculaneum tour was very informative - combination of history and humor. The light lunch not included between the 2 places was worth the stop. Wear good shoes for the hike up Mt. Vesuvius and the usual sunscreen and hat recommended. Thoroughly enjoyed our day and would highly recommend! This was a great tour. Our tour guide, Roberta, was excellent and had some great stories. 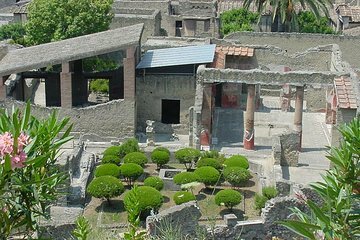 Ercolano was worth seeing even if you have seen Pompeii and is much more compact. Vesuvius was an experience - no guided tour really, given that everyone walks at their own pace. It is a climb and unfortunately the weather was not that great so visibility could have been better, but still worth it. Only change would be a little better organization at pick up point and the bus was really hot! Great tour! Guide was very enthusiastic and engaging! Hiking Mt Vesuvius was an amazing experience w great views. And we liked Herculaneum more than Pompeii. our tour guide was very good and we really enjoyed both trips. Informative and friendly guide for the day long tour, Well paced, plently of time to get up Vesuvius, and explore Herculaneum, definitely recommend the pizza from the restaurant during the lunch stop ! Enjoyed trip , I did not pay extra to go to top of Versuvius as don't like heights but my friend said it would be better to use guide at top but didn't have time to do. Herculaneum was excellent not as big as Pompeii but very well preserved definitely worth visiting . Guide was very helpful and informative . It was great, very good guide, she was wonderful, we would do it again. Stopping with the group for lunch was also a nice touch, this is where you can meet your fellow travlers.